Abstract: Drug-eluting stents (DESs) have minimized the limitations of bare-metal stents (BMSs) after percutaneous coronary interventions. Nevertheless, serious concerns remain about possible late complications of stenting, such as stent thrombosis (ST) and in-stent restenosis (ISR), although the introduction of second-generation DESs seems to have softened the phenomenon, compared to the first-generation ones. ST is a potentially catastrophic event, which has been markedly reduced by optimization of stent implantation, novel stent designs, and dual antiplatelet therapy. The exact mechanism to explain its occurrence is under investigation, and, realistically, multiple factors are responsible. ISR of BMSs has been previously considered as a stable condition with an early peak (at 6 months) of intimal hyperplasia, followed by a regression period beyond 1 year. On the contrary, both clinical and histologic studies of DESs have demonstrated evidence of continuous neointimal growth during long-term follow-up, named “late catch-up” phenomenon. The acknowledgment that ISR is a relatively benign clinical condition has been recently challenged by evidences which reported that patients with ISR can experience acute coronary syndromes. Intracoronary imaging is an invasive technology that allows identifying features of atherosclerotic plaque of stent implanted and of vascular healing after stenting; it is often used to complete diagnostic coronary angiography and to drive interventional procedures. 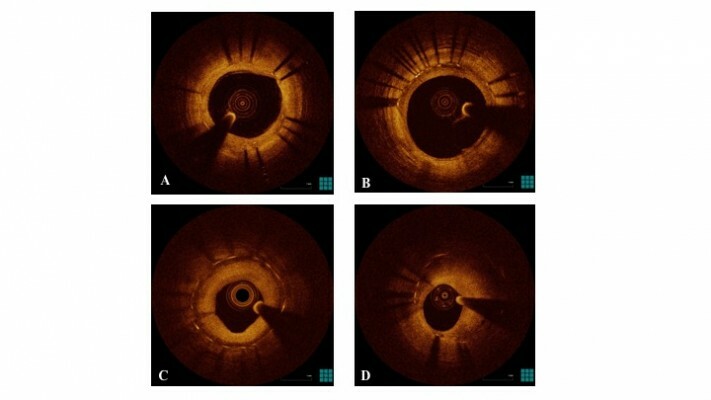 Intracoronary optical coherence tomography is currently considered a state-of-the-art imaging technique; it provides, compared to intravascular ultrasound, better resolution (at least >10 times), allowing the detailed characterization of the superficial structure of the vessel wall. Imaging studies “in vivo,” in agreement with histological findings, suggest that chronic inflammation and/or endothelial dysfunction may induce late de novo “neoatherosclerosis” inside both BMSs and DESs. So, neoatherosclerosis has become the prime suspect in the pathogenesis of late stent failure.